A hernia is when an organ pushes through the muscles or tissues that holds it in place. 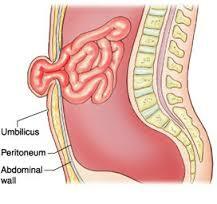 Hernias can occur several places in the body but often are found in the abdomen. There are different types of hernias, with inguinal hernias being the most prevalent. This type involves the intestines. Hiatal, umbilical, and incisional are other types of hernias. Depending on where in the body the hernia is located and how large it is will usually determine the type of treatment taken. Sometimes a doctor may monitor a hernia and recommend changes in diet or the activities that an individual can engage in. If the hernia is already large, continues to grow, or causes the individual increasing pain, surgery will be needed. There are generally two types of surgery used in hernia repair. The first is Laparoscopic surgery. This type uses miniature surgical equipment and a tiny camera so only a few incisions are made to repair the hernia. This type of surgery causes less damage to the surrounding muscle and tissue. There are drawbacks, however. Not all hernias can be repaired using Laparoscopic surgery and there is a higher chance that the hernia will return. Traditional surgery will involve a longer recovery. It may take up to six weeks before an individual can resume all normal activity. While the prognosis for most hernias is good, there are sometimes complications. Sometimes nerve damage occurs in the area where the hernia was repaired.